Our camping grounds are located in a grassy orchard behind the cottages. Most of our campsites have water and a 15 amp electrical hookup. There are showers and toilets and a covered barbecue house for gatherings or cooking should the weather demand. 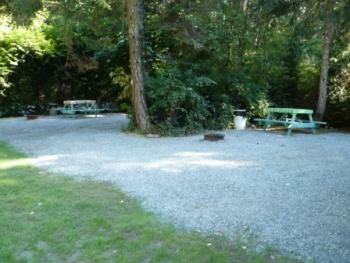 Camping rates $25.00 per night for 2 people (add $3.00 for each extra person). Boat moorage is available for $5.00 per day. Reservations can be made by calling us at 250-245-3000 and making a $25.00 deposit. Pets are welcome if kept on a leash and picked up after. Please note that most of our non-human guests are dogs. The campground is open from mid-June until mid-September. Reservations require prepayment by credit card (Visa or Master Card). We do not have sewer hook-ups and the sites may not be suitable for larger units.